Quilt Description: Rhapsody: to stitch, to sew together, unite with song. 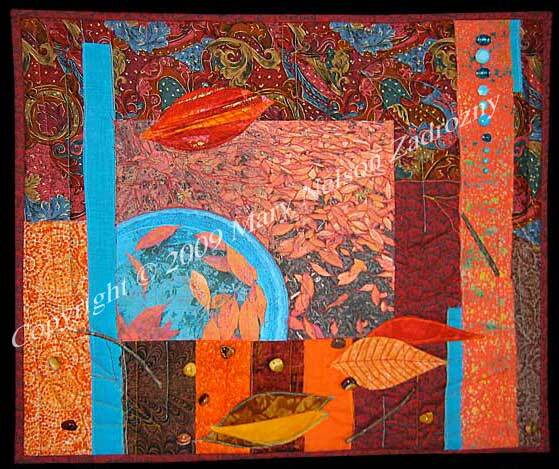 The color of the autumn season this year was more brilliant than ever and this quilt was inspired by a photo I took of the leaves as they fell around the birdbath. 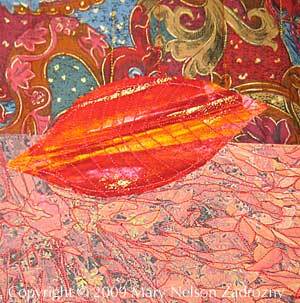 Materials: Cotton fabrics, photo transfer fabric, embellished with beads, twigs. Techniques: Machine Pieced, Appliqued and Machine Quilted. All embellishments were attached by hand. No fusible adhesives, interfacings, or stabilizers were used in this quilt.